Bresse Farms has been working hard to bring you a shipping box that we feel is the best on the market today. This box features a single hinge top, making it easy to load chicks and never misplace a lid again. We have tested these boxes for 5 years in all conditions summer/winter. We have made these boxes out of some very special cardboard for strength. This also makes the box light weight with perfect air flow. Also, at hinge area we have a place for customers phone number and info. THE PADS: we have gotten away from the excelsior pads. These pads are heavy and very costly for what they are a pad. 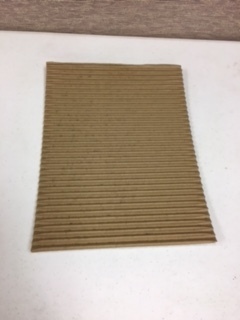 We have been working with a great cardboard company, we are now offering a pad that is water tight with an insulated backing. This helps to keep the chicks dryer and warmer in cold weather. This pad also protect's them from cold surfaces increasing the percentage of chicks delivered alive. These pads work great and we install them in the box free of charge. Saving you around 65 cents or more per box. Give these boxes a try and you will never use anything else. 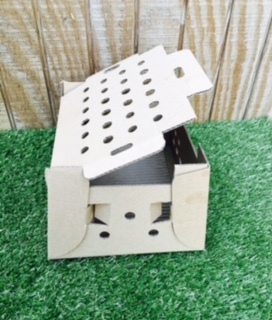 Size of box 12"x10"x 7"
We are proud to offer the first one piece hinged lid chick shipping box, we have been working on this box for 5 years, putting 30 years of experience into this box, paying attention to every detail. this box is perfect to ship 25 chicks, 30 pheasants, 75 quail, the box is made of super strong light weight cardboard, weighing only 6 oz with out pad, but super strong not that light weight cardboard most shipping boxes are made of. Our shipper has perfect air flow for summer and winter weather, hinged lid makes it easy to fill, and has a perfect place to put customers phone number next to hinged area. Top can be stapled or zip tied or taped, no staples required to ship chicks. We are proud to offer the first one piece hinged lid chick shipping box, we have been working on this box for 5 years, putting 30 years of experience into this box, paying attention to every detail. this box is perfect to ship 25 chicks, 30 pheasants, 75 quail, the box is made of super strong light weight cardboard, weighing only 6 oz with out pad, but super strong, not that light weight cardboard most shipping boxes are made of. Our shipper have perfect air flow for summer and winter weather, hinged lid makes it easy to fill, and has a perfect place to put customers phone number next to hinged area. Top can be stapled or zip tied or taped, no staples required to ship chicks.